“In Paris this week, a movie theatre has become an art school. A film…[is] showing us what surprising innovations, what emotion, what natural and well-designed lightning can add to cinematic fiction,” declared Colette, one of France’s preeminent novelists of the early 20th century. Director René Clair labeled it “one of the great accomplishments of the American cinema.” Within a few years of its release, this curious American film became a French cause célèbre, hypnotizing audiences, critics, and filmmakers alike with astonishing new techniques and cinematic possibilities. At the time, it was instrumental in legitimizing American—specifically Hollywood—films abroad in Europe. And yet a century later it has been almost completely ignored, overshadowed by the later epics and crowd-pleasing monoliths of its director. That director was Cecil B. DeMille. The film was The Cheat (1915). And its plummet into obscurity is our generation’s shame. A moody melodrama, The Cheat involves one of DeMille’s favorite themes: the dissolution and restoration of marriages. It begins when spoiled socialite Edith Hardy (Fannie Ward) embezzles $10,000 from a Red Cross charity for a get-rich-quick scheme that fails. Desperate for money, she signs her “virtue” away to Burmese ivory merchant Haka Arakau (Sessue Hayakawa) in exchange for a bond that will cover her loses. Unexpectedly, her husband Jack (Richard Hardy) wins big on an investment gamble and, claiming a catastrophic night playing Bridge, manages to convince him to give her the $10,000 she needs to pay Haka off. But Haka refuses and cruelly brands her shoulder with his seal, claiming her as his property. When Edith shoots him in the shoulder while escaping, Jack is framed for the crime. All this leads to a typically melodramatic courtroom sequence with Jack’s name being cleared, Haka being revealed for the dastardly villain he is, and love conquering all with husband and wife tearfully reconciling. The Cheat proves an uncomfortable sit for modern viewers in large part due to the character of Haka. Unapologetically monstrous, Haka embodies every Western suspicion of “Orientals” as greedy, slant-eyed schemers who harbor both a retarded regard for morality and a rapacious hunger for innocent white women. His lodgings are bathed in demonic blacks and shadows: a dour Buddhist shrine crouches in darkness next to the brass pot where he heats his infernal brand. In the film’s original release Haka was Japanese—his name was Hishituru Tori—but his ethnicity was changed to Burmese when re-released in 1918 out of respect for Japan’s allegiance as an American ally. But the film’s visual coding of Haka as Japanese is unmistakeable: not only does he wear a haori over his Western shirts, his brand is a Shintō torii. These stereotypes cannot—and should not—be disregarded or forgiven. But it is important not to let them overshadow historical and critical evaluation of The Cheat. Much like D. W. Griffith’s The Birth of a Nation (1915), the film is an integral stepping stone in the evolution of cinematic language. Chief among its innovations was cinematographer Alvin Wyckoff’s striking use of shadows and darkness, particularly in the aforementioned scenes involving Haka’s lodgings. Wyckoff repeatedly plunges nearly the entire screen in darkness only for the characters’ faces or bodies to suddenly materialize in a shock of light. French audiences were amazed by the practically chiaroscuro lighting since the widespread use of arc lamps on film sets had made such illuminations essentially impossible. The characters’ internal, psychological struggles were plasticized via visual language rather than merely the performers’ body language and acting. 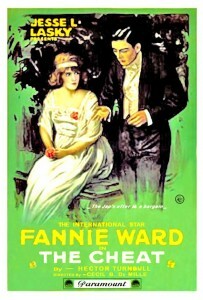 The scene where Edith and Jack reunite in jail before his trial is given extra power not by Ward and Hardy’s emotional histrionics, but by the sinister shadows of prison bars thrown over them. In so many ways The Cheat heralded the future of cinema: Hollywood’s supremacy over the international market; dramatic lighting as a means to intensify emotions and mood; and, unfortunately, the negative portrayal of ethnic minorities. If any one film should be regarded as evidence that DeMille’s reputation as a petty creator of mindless spectacle entertainment should be re-evaluated, The Cheat stands head-and-shoulders above the rest.